Surely you have seen the GO! Baby Fabric cutters make an appearance in the crafty blogosphere in a quite a few places recently. I must admit that I got pretty curious about it too, so when the people over at Accuquilt contacted me about trying out their nifty machine I just couldn’t resist! I’m a bit clumsy when it comes to neatly cutting stuff for quilts and/or patchwork projects so the idea of creating lots of neatly cut shapes almost effortlessly was tempting. I was also slightly worried, what if I didn’t like it... or worse, what if I couldn’t figure out how to handle the GO! Baby Fabric cutter? I needn’t have worried: I have been happily cutting squares, circles and strips since it arrived! When my Go! Baby Fabric Cutter was delivered I was surprised at how small it was (there is also a bigger ‘Studio’ version available) and surprisingly heavy for it’s size too! I guess it needs to be on the heavy side to keep things stable while you are using it. GO! dies come in all shapes and sizes. There is a wide choice of appliqué designs for example and many ‘classic’ quilt shapes like squares, triangles and tumblers. My first choice was the 2.5” strip cutter, primarily because I dislike cutting strips for binding ( I always make my strips for quilt bindings 2.5” wide). So last week when I need to make a (scrappy) binding I cut my strips with the GO! Cutter and I produced my best binding ever in no time at all. I thought it would also come in handy (with the Scrap Vomit Quilt in mind…) to make lots of 2.5” squares fairly quickly! Go! Baby in action. Fabric is put on die, then put cutting mat on top and turn the handle! The second die I chose was a ‘value pack’ with a 2.5” square, two (2.5” wide) triangles and a 4.5” square. Because there is some loss of fabric cutting squares I think this particularly die is great to use up scraps. The brilliant thing about the triangle is the added seam allowance which makes it super easy to make perfect half squares triangles etc. My third choice were the circle dies (2,3 and 5”) I would have loved some other ‘difficult -to- cut-shape’ dies as well like a tumbler or diamond but finally settled for the circles. You can cut several layers of fabric at the same time (I used regular quilting cottons) apparently up to 6 layers but I found that about 3 layers for me was about right. After playing around with the squares and circles (I kept ‘feeding’ my GO! Baby Fabric Cutter new scraps, it was kind of addictive) I came up with this design: Tonka &amp;amp;amp;amp; the Stars. It combines patchwork, appliqué and embroidery. It’s a quite simple and quick project and we all love instant gratification too sometimes, right? My pillow cover is 12.25 by 12.25" (an odd size I admit but it worked for the pillow insert I had on hand) but the design is easily adaptable to make larger pillow covers by adding inches or even strips of fabric around the original design. Print of the Tonka (hedgehog) pattern. You can download it here. I started with cutting 16 2.5 “ squares in different shades of blue and a yellow one as well. For the top strip I cut a 2 by 12.75" piece of dark blue fabric. And for the back of the pillow I cut a 2.5 by 12.75“ strip of dark blue fabric. From the linen cut 5 2.5" squares and a 12.75 by 7" piece as well. These will form part of the sky above your buildings. From the yellow/orange coloured scraps I cut three different sized circles (5”, 3” and 2” diameter) to make a ‘moon’. Unless stated differently I used a 1/4 an inch seam allowance. 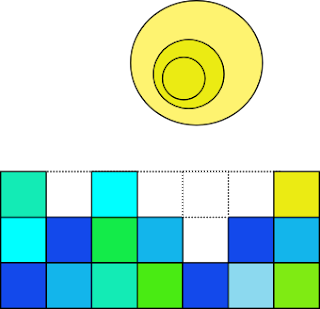 Arrange the blue squares in stacks of various heights to resemble buildings (or rather a silhouette outline of buildings).‘Top’ the lower buildings up with the linen squares. (see picture) Sew squares together and sew rows together. Set aside. Arrange the three circles placing the smallest circle off center on the medium sized circle. (see picture) Pin and stitch with a small zig zag all around (more than once if you’d like) Place your medium size circle on the largest circle again placing it off center and stitch w zig zag. Take the 12.75 by 7 “ piece of linen and place the largest circle (with the other circles now sewed on) on the right hand side (see picture, allow ca 1.5" from the top) Again sew on using a zig zag stitch. Use your water erasable pen and ruler to draw two lines from the top of one of the buildings to the moon. Make sure that the bottom of the ladder is wider than the top. I made the bottom of the ladder about 1" wide and the top about 0.4” wide. Draw steps parallel to the ‘roof’ of your building and decrease the space between the steps slightly the closer you get to the moon. Stick your little Tonka the Hedgehog pattern on a window or put it on a lightbox and use the water erasable pen to transfer it your fabric near the top of the ladder you just drew. Or, alternatively, draw the hedgehog freehand. 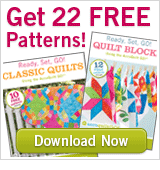 Read more about transferring embroidery patterns here. For most of the embroidered bits I used all 6 strands of embroidery floss. I used a chunky looking stem stitch for the sides of the ladder in green (since there were green accents in the ‘moon’ and in the ‘buildings’) and a back stitch in a slightly darker shade of green for the steps. Tonka the hedgehog was outlined in a back stitch with in a medium brown shade. The black quills were embroidered in a quite random stitch, much like a seed stitch. Arms and legs were stitched in black using a back stitch. For the eyes and the tiny nose I used 2 strands of floss and a tiny satin stitch! Add some stars in yellow here and there by making a...Star Stitch! Are you still with me? Nearly done, we just have to put the parts together now. Trim the patchwork panel by cutting 0.8" off from the sides and bottom. Sew it to the linen 'moon' panel and press. I made a simple 'envelope' style back and used a folded strip on the outer back panel to coordinate with the front of the pillow. Finish the other back panel by folding over the long (12.75") side first by a 1/4 of an inch and again by 1/2 inch and sew the hem. To make the back lay the back panel (with the strip) onto the front panel (right sides together) and put the hemmed back panel on top of that. Pin all around and sew all panels together. Turn inside out and you are done! Now I hope you have enjoyed the product review and the Tonka tutorial. Please let me know if something doesn't add up (which could easily be the case with my math skills) and if you decide to make your own Tonka the Hedgehog pillow please post a photo in the Follow the White Bunny Flickr group or on my Facebook Page! Edit: don't forget to have a peek at the post above, you can enter my giveaway to win a Go! Fabric Cutter all for your self! Yay! Cute pillow Nicole! !Lucky you getting to try a BabyGo! ...not that I meant other people's are, btw LOL! But your embroidery and applique has a very distinct style and it's not diluted at all ... does that sound better? I love this pillow! Great way of combining the Go with embroidery! What a darling pillow! Thanks for the tutorial.